Do you realize that the very fastest and strongest out of the millions of sperm competing for a place in that egg was the beginning of you? Therefore, by default, you're already the pick of the litter. Well done. I believe it is also our first time working as a team since it takes 3-5 sperm to get through the outer layer of the egg before one can actually penetrate and fertilize the egg. So I guess in a way, we are all the result of team work, and we just happen to be either the hardest worker or the one that finished the job and takes all the credit. "congratulations. the only reason you were born, because you were a greedy little jerk." actually, that explains a lot. You know, more males than females are conceived (though the birth rates are closer to equal between sexes). The thought is that the Y-chromosome carrying sperm are lighter weight, hence faster, than the sperm carrying around the much heftier X-chromosomes. 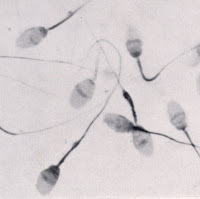 I'm just curious as to what else you came across when you did a Google image search for "swimming sperm."